1Must apply online by June 2, 2019. 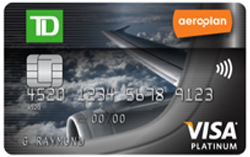 Welcome Bonus of 10,000 Aeroplan Miles (“Welcome Bonus Miles”) will be awarded to the Aeroplan Member account associated with the TD® Aeroplan® Visa® Platinum Card Account (“Account”) only after the first Purchase is made on the Account. To receive the additional 5,000 Aeroplan Miles, you must make $1,000 in Purchases on your Account, including your first Purchase within 90 days of Account opening. If you have opened an Account in the last 6 months, you will not be eligible for these offers. We reserve the right to limit the number of Accounts opened by and the number of miles awarded to any one person. Rebate of the Annual Fee for the first year for the Primary Cardholder will occur when you have applied for an Account by June 2, 2019. Rebate will be applied within 2 monthly statements from the date of Account opening. the Annual Fee for any Authorized User Cards added to the Account continues to apply. Your Account must be in good standing at the time bonus miles are awarded. Please allow 8 weeks after the conditions for each offer are fulfilled for the miles to be credited to your Aeroplan Member account. Offers may be changed, withdrawn or extended at any time and cannot be combined with any other offer unless otherwise specified. These miles are not eligible for Aeroplan status. +The number of Aeroplan Miles required for the destination is accurate as of February 7, 2019 of communication and is subject to change at any time by Aeroplan Inc. According to Aeroplan's current reward chart, destinations reflect a roundtrip Fixed Mileage Flight Reward® in Economy Class departing from within Canada or the continental US (plus applicable fees and taxes). Fixed Mileage Flight Reward availability is capacity controlled and is subject to availability at time of booking as well as seasonality of demand. Aeroplan Flight Rewards are subject to taxes, landing and departure fees, and other charges and surcharges may apply. Aeroplan Partners, rules and regulations are subject to change without notice. For full details on Aeroplan's current reward chart, please visit aeroplan.com 2Primary Cardholder remains liable for all charges to the Account, including those made by an Authorized User.